So you’ve made it to the top of the mountain. Either you’ve taken the five-minute ride in the 360-degree rotating cable car, or you’ve ascended 1,086 metres on foot (which takes substantially longer). Regardless of how you’ve reached the flat-topped summit of Table Mountain, one thing is for sure… you will need to get back down. 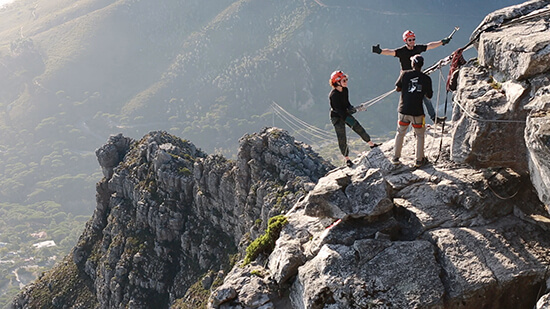 How about opting for the most direct route: tie into your harness, lean back and kick off as you abseil down one of the mountain's vertical faces? I should point out that the abseil doesn't take you to the bottom of the mountain, so at the end of your descent you still have a 30-minute hike back to the top. So you'll need to take the cable car down after all, but at least you’ll have your adrenaline high to keep you company. Armed with flip flops, a beach towel and swimwear, it’s fair to say that you don’t look as though you're set to spend time in the company of penguins. But these penguins don’t have the bitter Antarctic climate to contend with, these are African penguins and they’ve picked a home in the sunshine. 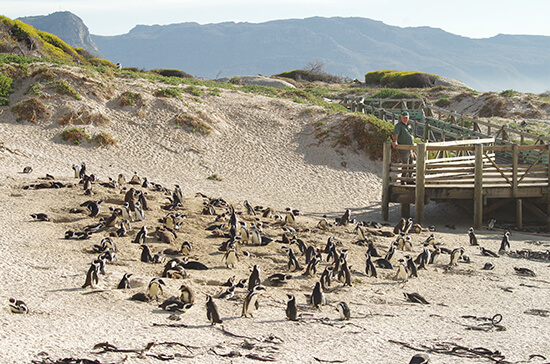 Boulders Beach is less than 90 minutes’ drive from Cape Town and, aside from being a lovely place to enjoy a bit of sand and sun, it’s also home to a large colony of African penguins. The best place to head to for photos is the viewing boardwalk but the modest entry fee also grants you access to the beach too where the penguins are frequent visitors, although in significantly fewer numbers. Set yourself down on a spot on the sand and you could easily find a few rogue penguins waddling past to have a peak at you. 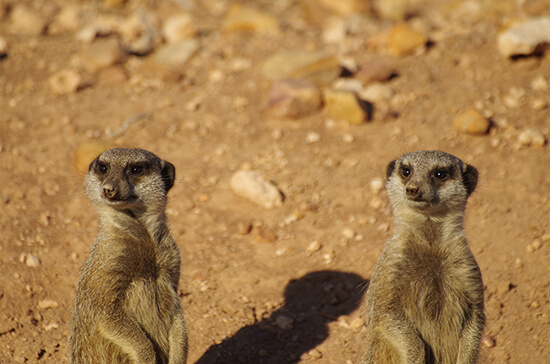 After about 30 minutes of jokes about meerkats oversleeping, as well as learning some really interesting facts about the colony, the first meerkat cautiously poked his head out of a burrow. Within 10 minutes the whole colony were standing to attention, just metres from our vehicle. The younger ones were play-fighting and chasing one another, while the older ones kept watch. At no point do any of them seem in the least bit bothered that a bunch of grinning tourists are watching. 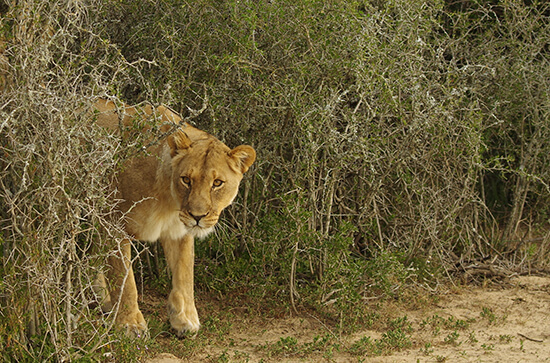 No visit to South Africa would be complete without getting on safari. Right at the end of my trip I stayed at Long Lee Manor in Shamwari Game Reserve. And what a way to finish! As soon as I had checked in, before I had even set foot in a safari vehicle, I was gazing out over the reserve where I could see zebra, springbok and, in the distance, a lone elephant magnificently silhouetting itself against the skyline. I could see all this, just from the hotel! Needless to say, I was chomping at the bit to get out on a game drive. And when I did I was not disappointed. Within minutes we were among a herd of zebra that were accompanied by a family of warthogs. Another 10 minutes later and our jaw were hitting the floor as an adult male and female lion passed just a few metres from our vehicle. This place is just incredible, what would we see next? ...A herd of elephants! We approached slowly and kept a respectable distance but, once they were comfortable with us being there, they just ignored us completely and surrounded the vehicle. I was buzzing. Surely this must be the most successful game drive ever? There was no way it could get any better. Oh wait! Rhinos. Seven of them. Grazing and playing on the open plains. I admit I must have been pretty lucky to see all of this wildlife on one game drive, so my advice would be to spend three nights in a safari park and give yourself a time to see as much as possible. It’s simply the best way to end an unforgettable South Africa holiday. Embark on our Garden Route & Safari holiday and discover the best of this fantastic region. For more advice on our tailor-made South Africa itineraries, make an appointment with a Travel Expert.